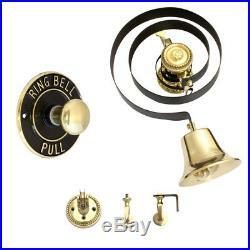 Wall Mounted, Period Style, Mechanical Butlers Bell Kit, Brass with Brass Pull. This is a traditional 1900s classic design, works with a separate brass pull. For the sound clips to work you need to Download and Install Adobe Flash Player. To download the latest version of Adobe Flash Player. Butlers Bell size - 250 x 160mm. Traditional Solid Heavy Brass Pull - 100mm Dia. Butlers Bell Colour - black and brass. UK company dedicated to the supply of Door Chimes and Doorbells. We are quite happy to talk through your requirements and make suggestions. However our working ours are 9.00am to 5.30pm. Monday to Friday, and we are a purely internet company without a showroom. The item "Butlers Bell Kit Brass, Brass Pull" is in sale since Sunday, February 4, 2018. This item is in the category "Antiques\Architectural & Garden\Hardware\Door Bells & Knockers". The seller is "xtrasonline" and is located in , Sheffield. This item can be shipped worldwide.